It is not uncommon for people to avoid estate planning. Some think they don’t have much of an estate to make drafting a will worth the effort, while others are uncomfortable facing the prospect of their own mortality. Still others believe that they can take care of their estate without drafting a will. Whatever the reason, about half of adult Americans – including older Americans – either don’t have a will or don’t keep it updated. If you are wondering whether you really need a will or not, consider the following reasons why having a will is a really good idea. Without a will, the state of Washington decides where your money and all your property will go after you die. Washington’s laws of intestate succession follow strict rules regarding which family members will receive an inheritance, in what order and in what proportion. Theoretically, the state is trying to distribute your property the way you would have wanted, but it really has no idea, because you left no instructions, i.e. a will. Not only may your property wind up in the hands of people you would not have left an inheritance to, but the state’s intestacy laws also do not provide for making any gifts to charities, colleges, churches, museums or other organizations or institutions that you could leave a legacy to in a will. Naming an executor (also known as an administrator or personal representative) allows you to pick the best person for the demanding job of overseeing the administration of your estate. If you don’t draft a will that names an executor of your estate, then the state will decide who the executor should be, and may appoint your spouse or other distraught family member who may not be equipped to deal with the challenges of the job. Whether you have minor children at the time a will is created or may perhaps have children later in life, naming a guardian in your will for your children will ensure that they are looked after by someone you know and trust. Without such a provision, the state will determine where the children go, which may be to people you would not choose on your own, or even result in your children becoming wards of the state. Also known as will trusts because they are specified in the will and take effect upon the death of the testator, testamentary trusts can be used to distribute property to beneficiaries while placing important conditions or restrictions on the gift, such as withholding the full amount until the beneficiary reaches a certain age, or requiring the recipient to complete a higher education degree as a condition of receiving trust assets. Without a will, your children may receive a portion of your estate without any restrictions on how they spend it. Disposing of property by funding insurance policies or putting property into joint title may be a good idea, but trying to do this yourself can be a mistake. Consider, for instance, the tax implications of using a life insurance policy versus a life insurance trust, or leaving a significant amount of money to a youthful heir with no strings attached. Also, jointly titling property may sound simple, but there are actually many different types of joint title arrangements, and selecting the wrong method may frustrate what you are trying to accomplish. People who think they are saving money by not bothering with a will often end up with much more being spent trying to fix costly mistakes. Even if you are attempting to avoid probate by putting all of your assets into revocable living trusts or other non-probate instruments, there is still a chance that you will fail to include all of your property, leaving these assets to be probated according to the laws of intestate succession. 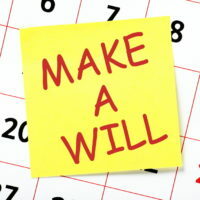 Along with all the other good reasons for creating a will, it is important to know that a will can contain what is known as a pour-over provision, by which you stipulate that any part of your estate that is not otherwise included in the trust you create will be poured over into that trust when your estate is administered, so that nothing will be forgotten. For help with estate planning or trust and probate administration in the Vancouver area, contact John Lutgens, Attorney at Law, at 360-693-2119 for a complimentary, confidential consultation.